There is actually only three cheeses in this recipe. Oops. You can always add cheddar if you are feeling gipped. However, the three cheese will do the trick, trust me. 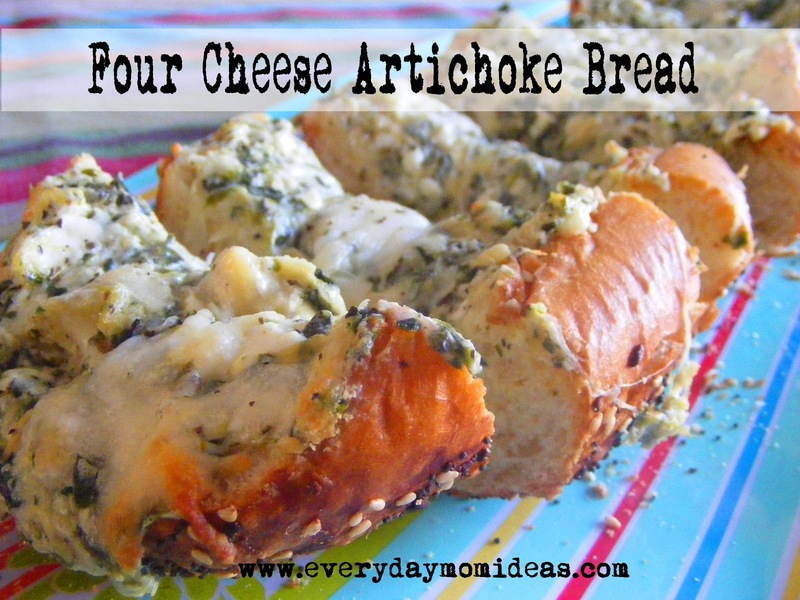 Just adding my yummy three cheese artichoke dip recipe to the top of a loaf of french bread will do wonders! Preheat oven to 350 degrees F . Sliced lengthwise set french bread slices on baking dish. In a medium bowl, mix together cream cheese, mayonnaise, Parmesan cheese, 1/2 cup of mozzarella cheese, basil, garlic salt, pepper. Gently stir in chopped artichoke hearts and spinach. Spread the mixture divided evenly on top of slices of french bread. Top with 1/4 cup of mozzarella cheese. Sprinkle top with a little basil. Bake in the preheated oven 25 minutes, or until lightly browned. I found this recipe on Pinterest and just made it tonight. It was delicious! I will definitely make it again. Thanks for sharing.